This is an easy Halloween project for young ones, and another winner from our school's Harvest Festival. 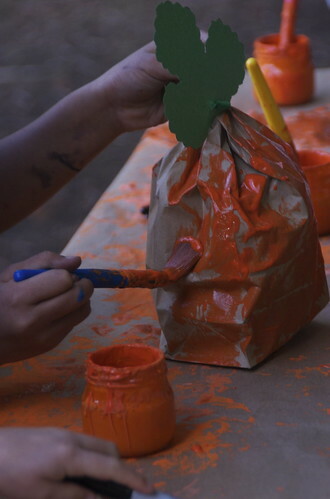 All you need is a paper lunch bag, some orange paint, a bit or string and a scrap of green paper. Fill your bag with whatever scraps are overflowing from your recycling bin (as ours usually is, unfortunately). Tie shut with string looped through a green paper leaf (easy to cut out), and paint bright pumpkin orange. If you're feeling mighty ambitious, you can paint on a Jack O'Lantern face with black paint after the orange has dried. Ha! We've got three of these in our dining room that the kids did in preschool years ago and they come out every year for halloween. Super fun! 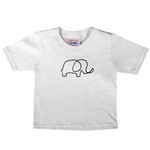 Click here for more elephant gear. ©2006 - 2009 Véronique Christensen. Images, and content copyright protected. All rights reserved.